None of the matches caught his eye as much as the matchmaker himself. I did not read the first book in this series. However, I never thought that I was missing out on anything. The main characters in this book have a friendship. I wouldn't really categorize this story as a "romance" in the sense, but more of a friends turned to lovers. Brent is a successful realtor who helps his old school rival, Navashen, to find a house when Navashen relocates to be closer to his family. Brent is the center of the party and has a lot of friends that he's helped find happiness. However, because of his own past, he's reluctant to take the plunge himself. Navashen is a sheltered, immature character, which is somewhat true of medical students. They have no time for outside relationships because they are spending all of their spare time studying and learning. He is head of the NICU department and he is learning how to be an adult and live outside of his family's shadow. There is no real depth to him. Then you have Akshat. This is Navashen's younger brother. It is hinted that he has a delay of some kind, but we are never really given a clear picture. He defends his older brother with every fiber of his being and loves with his entire self. I really enjoyed this character. Then you have Navashen's parents. They are old fashioned and, especially his mom, are somewhat judgmental about Navashen's sexual orientation. Overall, this was a slightly stunted story. No real drama, no real heat, and it was more ho-hum regarding all of the secondary characters too. This is a very sweet friends to lovers romance. 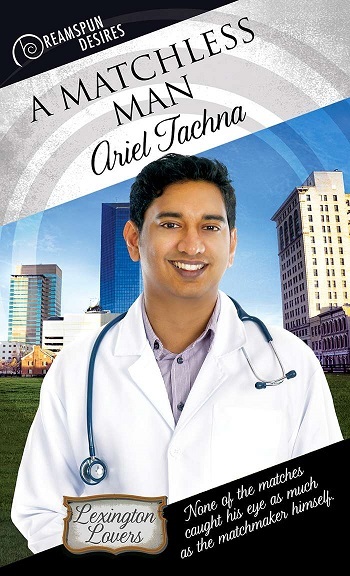 When Navashen, an introverted doctor, returns to his hometown to run the NICU, his realtor, an extroverted high school friend, takes him under his wing. Work and family commitments make it difficult for Navashen to socialise, but he and Brent quickly form a strong friendship that has the possibility to become something more. I enjoyed Navashen's alternative approach to relationships. He doesn’t want a relationship arranged by his parents, but he also rejects the importance Western culture places on physical attractiveness. His desire for a man who can be a true life partner is an interesting blend of his Eastern traditions and his Western realities. The author’s research into Navashen’s job, his training, and his education is refreshingly thorough. I’m married to a doctor and I am constantly annoyed by the plethora of dashing, sociable, charming 35 year old heads of medicine or surgery that seem to dominate romance fiction. I love that Navashen’s job makes a social life almost impossible. I love him as a quiet, cautious introvert. He feels real to the point that he is more than a tiny bit...boring. Or maybe just sweetly human. Navashen’s relationship with his family is also realistic. The family’s struggle to treat Akshat, Navashen’s disabled brother, as an adult is complicated and Navashen and Akshat’s relationship has been delicately written. The conflict between Navashen and his parents when he starts to date a white man is also written sensitively and without any drama. And finally… Brent. He is a solid friend, he accepts and includes Akshat in his social activities and he genuinely cares for Navashen in so many practical ways. He is the true life partner Navashen has been looking for and I love the gentle, steady commitment between these two. This isn’t a steamy romance by any means; it is the story of a solid connection between two quite ordinary men. This is a gentle book with very little drama or angst. It is a different style and pace for Ariel Tachna, but I really enjoyed it. Reviewers on the Wicked Reads Review Team were provided a free copy of A Matchless Man (Lexington Lovers #2) by Ariel Tachna to read and review.